according to my inside sources, the whole town has had a nasty lingering virus. finally, we got it too. not the most fun april fool's gag. dan has a cough, i've got one that turned into an earache. but benji's went straight to his lungs. 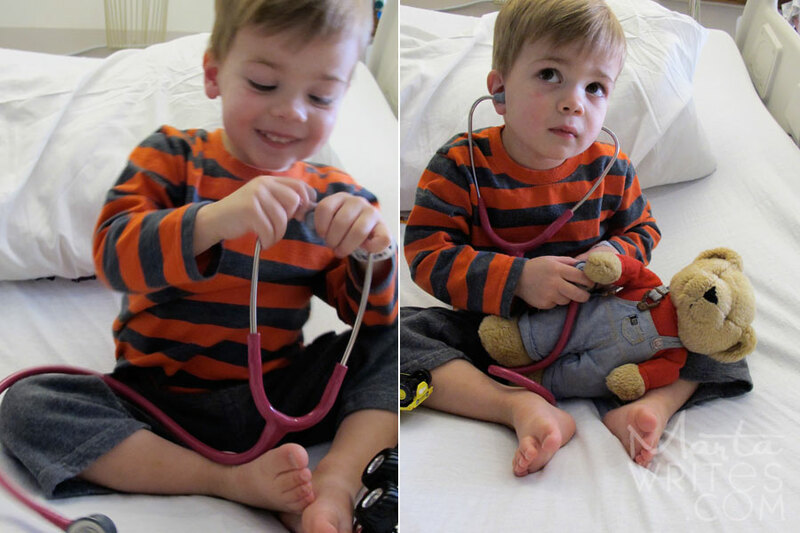 last monday we took our feverish, coughing little boy to the doctor. 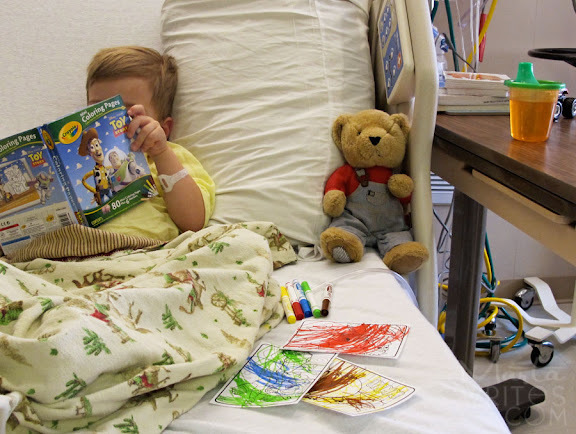 i thought they'd send us home with an order to drink lots of fluids and rest, but since benji was feeling so bad he wanted to bring his favorite bear along. it turned out, this was serious. 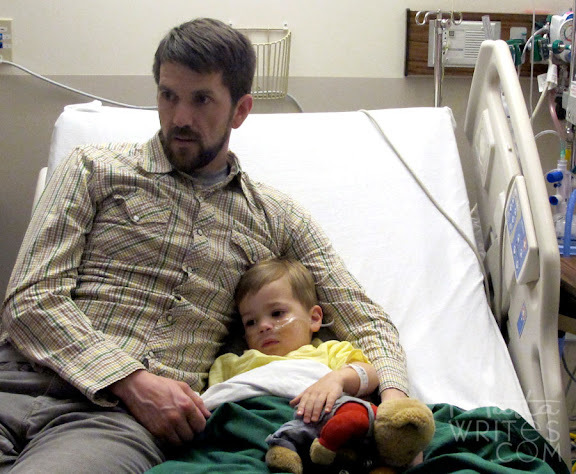 due to benji's severe breathing difficulty, the doctor sent us straight to the hospital! benji got an x-ray, an iv and oxygen. he was one very brave boy. i love him entirely. i never imagined his first night on a big boy bed would have to be in the hospital! we ended up staying for five days. every day this nice lady would ring up our room with menu choices, wanting to take our order for the following day. every day i optimistically told her that we would probably be outta here by then. but by day three i stopped thinking we were on the verge of leaving. by now we know all the nurses' names (and love them) and benji knows what all those buttons on the hospital bed do (he accidentally prank-called the nurse twice). benj charmed the hospital staff and we tried hard to make it homey for him. dan took over on night shifts so i could get some good sleep in my own bed. it tore me up inside to be separated, but i also knew i needed rest so i could stay strong for benji. while i worried and waited and watched my boy sleep, i listened to the quiet. i tried to stay calm. i tried to read my overdue library book. (i cracked it several times and still haven't started it.) in the end, i mostly wondered what i could take from our experience. i'll share a few of my thoughts. :: no one is ever ready for a disruption. which is why real life rescuers are so important. i feel so grateful for the family and friends who came to our aid with visits, calls and texts. we experienced what true friendship is all about. such good and sweet friends came out (in the snowy april weather) with a balloon, a new toy truck, art supplies and/or food to brighten our lives a little. i want to be a more supportive person. these kindnesses meant so much to me. hilary even let me borrow her ipad to help break-up any boredom! how great is that? (am totally an ipad convert by the way.) i loved that benji wanted to snuggle together the entire time. :: my heart cracked open with newfound empathy. whenever a challenge hits us, we can understand someone else's plight a bit more. i had a closer view of the harsh reality people everywhere are dealing with. i can't imagine how it would be to take a child to regular chemo appointments, to have a child who does not develop like the others and wishing to take away her pain, to bring a sick child through the entrance doors and then to leave without him. i know of friends who have had grave dark days and sadness in the hospital. my heart mourns with them. dan and i felt extremely lucky when, after five days, the nurse rolled our boy to the hospital exit in a little red wagon and we finally buckled him into his car seat again. :: while away i missed the routine. eating around our own table, setting up train tracks. once benji was hooked up to beeping monitors, i realized the freedom i take for granted. the pure ease in playing together on a regular basis completely unrestricted is such a blessing. still, his joy and playfulness remained. even outside our normal routine we figured out ways to get creative and make do. kids are so adaptable. one day we covered his hospital bed sheet with stickers. 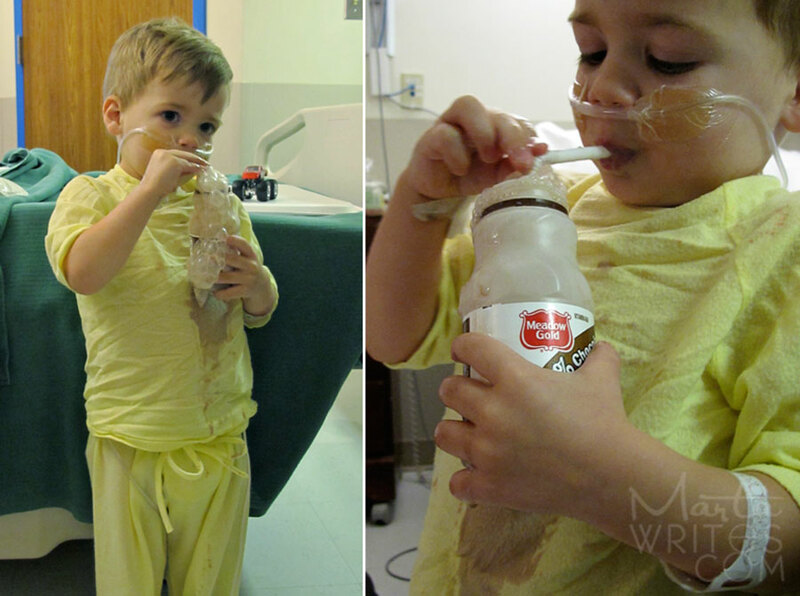 a favorite moment was when the doctor asked benji to blow bubbles in his chocolate milk. a volcano of chocolatey bubbles rolled down his shirt again and again. his small audience roared with cheers. who knew strengthening lungs could be so messy, or so fun. :: i've always known that God gives us experiences to strengthen our weaknesses. however, i suddenly realized that He also gives us experiences that strengthen the skills he has already blessed us with. to utilize what we are already made of is a really powerful thing. after being cooped up for five days, i feel renewed energy to make more of these bodies we've been given. i want to run and race and give thanks for every bone and muscle in this machine of mine. i am all revved up about taking care of it, physically and spiritually. we are here for a purpose. i pondered the questions, am i moving toward my greatest goals in life? am i making the most of all the benefits i've been blessed with? am i finding the glass half empty or half full? am i inching towards accomplishing what i hope to do here? am i doing all that i can do? :: priorities align themselves real quick when you are the mom in the situation. filling out forms and writing parent in the blank next to relation to the patient showed me all over again that we are the ones who need to be strong. bravery is born in unexpected ways. i would do anything for my boy. i'm grateful for the wonderful care we received, and am happy to be home together again. our chatty, enthusiastic two year-old has returned and we are soaking in every moment. thank you for your thoughts and prayers. xo. Aw, sweet little boy. I'm glad you guys are all healthy and back home. Oh my, you poor things! As a mom, the hospital photos really tugged at my heartstrings. Such an ordeal for all of you. I'm so glad to hear Benji on the mend! My heart goes out to you. What a blessing health is, especially with our little ones. I'm glad your little man is better. i am so glad to hear that benji is doing well and that you are all home. i read your post with tears and chills. i am sure that cooper was there watching over benji and making sure he was all right. he does that to people who mean so much to his mama. wishing you playful days this week. Wow! Five days is a long time. Seems like he was a pretty brave little boy. Glad he's feeling better again. Oh my goodness, Marta! Poor Benji! So glad to know that he's well again and you're all home together. I hate it when my boys are sick... it's so worrying and upsetting to see them like that. Here's to your good health and a long, happy spring and summer, without a single hospital room in sight! PS: My blogging friend Cass bought me one of your mini-diaries for my birthday! I can't tell you how thrilled I was to receive it! Oh, what a brave boy...such a trial for you all. I am happy to hear he is home and healthy. You write so eloquently and openly...thank you for sharing. Wow. The fact that you can look at a five day stay in the hospital with your boy in such a positive way is truly inspiring. I would be such a worrier and you have taken such an inspiring approach to all of this. Thank you for helping me remember that God gives us struggles for a reason. So happy to hear that Benji is okay! I am so glad he's okay! I wish we lived closer. I'd have totally been able to help! So glad for the blessing that recovery brings - the renewed outlook on everything. Hugs! It was so sad seeing sweet little Benji in that hospital room! He was such a trooper though and I am so glad he is back home and feeling better. What a scary and trying experience for your little family. The whole time you were there I was just wishing there was more I could do. You truly are an inspiration with how gracefully you handled it all... even with an ear infection yourself! Thank you for always being such an awesome example to me. oh marta! I'm so sorry. Lily has had reactive airways disorder since she was 1 and there have been many hospital trips for breathing treatments, etc. It can be really scary. I'm glad Benji is on the mend and back home. Hugs to you and your family!! Blowing chocolate milk bubbles to strengthen lungs? Who knew? Thank goodness for pediatricians that really KNOW children. That's amazing. i'm so happy to hear you are back at home and your precious little one is doing much better. my heart totally feels for you! how scary!! you put into words what i felt last summer as my three children and i were vacationing more than 1000 miles away from home. my 3 year old became sick with an infection and a visit to an urgent care ended us up in the hospital for 3 long days. i never left my daughters side, yet i had to say goodbye to my other two children, who were 5 & 6. my heart was torn. i worried about them too as i held my sick baby in my arms so unsure of what was really wrong. i had never been so afraid in my whole life, yet through faith, i found this incredible strength and we made it through. i am so sorry you had to go through it all too... glad benji is on the mend!! oh, marta, the picture of him with the oxygen taped to his little face made me tear up. how scary, so so glad he's on the mend..
Oh dear; you have been through so many trying times, but I love the insights you have gained and I am so glad Benji is doing well again!! It does my heart good to see Benji on the mend. Your insights were something I needed to hear after the week I had. I can't believe it Mart, I was wondering where you've been. I am glad Benj is getting back to normal. We have experienced just one night in a hospital with our girls and it might just have been the longest night of my life. Glad you survived. glad you and your little bird have been freed and are back in your nest and getting back to normal. you make me glad that our trip to the hospital was a short visit. though i now know that i can react well to gushing head-wounds, i'm guessing i could've lived a lifetime and been glad about not having that knowledge! thank you for sharing the experience and the contents on your heart. am so happy to see that benji smile at the end of the post! poor guy. happy to read all is well and getting back to normal again. loved your words marta. thanks. So glad to hear Benj is on the mend. I can't even imagine how scary that would be. The worry, the prayers being said. It breaks my heart that you're so far away and we are unable to run up and help. I'm glad you're all feeling better, and as you always do, are taking this situation and growing from it. I am in awe of your strength and positive attitude. I am also so happy to hear you're an iPad believer. They are the best, especially for kids! I loved your words today . . . esp. "bravery is born in unexpected ways." So true. I will remember those six words. Glad you are back . . . healthy and home. glad to hear benji is back home, and that all is well (or on its way). I was a kid in the hospital many, MANY times for breathing issues, and I can just say that kids even though they are sick just want to know they are safe and being taken care of, by hospital staff and of course by family :) sounds like this was one of those moments that remind us to slow down, appreciate the good stuff, and show us how strong we can be when needed. nice work, mama. My heart goes out to you!... thank you for your words about what is truly important in life. your sweet boy in his little hospital clothes is to much! what a good little patient. i'm sure all the nurses loved you guys. i'm so happy you are back on track to "normal" days! and the renewed energy & outlook is a gift all in its self. Glad to hear your son is on the mend and at home. So very sorry your little guy was so sick. We have had our fair share of hospital stays so I know it's not a fun place to be at all. So glad you are all home now. Praises that your little man is on the mend. I stop by your blog frequently but have never posted before--wanted you to know your family is in my prayers. It's funny how you feel like you know someone just by reading a blog...if I were anywhere near you, I would surely have been there to help, stranger or not. Hugs to you all. Marta, I am so glad that he is home and doing all better. How terrifying and yet you find the beauty in it all. He is a brave little man... and an adorable belly sleeper. I am sooo glad he is finally home. Five days can feel like an eternity in the hospital. It is so sad to see little Benji hooked up to those machines and in the hospital clothes. I love the happy pictures at the end. I loved your thoughts too. Being in the hospital does make you realize all that we take for granted. I'm really grateful for great medicine and that he is doing better! glad you are home. glad benji is well. glad everything is getting back to normal. you're a good mama! Beautiful post. So glad Benji is okay. Thank you for sharing what you learned. I am glad everyone is home again. Thanks for sharing the light in the tunnel. So glad to hear you're both home & your son is doing better! Thanks for this post. It is such a wonderful reminder and literally moved me to tears. So glad Benji is home and doing well...what a scary experience for all of you! Thank you for sharing your perspective in such a lovely post. So glad he is home and getting back to normal. You are so insightful and I love reading your blog. Benji is lucky to have you. So happy that Benji is home and feeling better! you are such a delightful human. every time i read your blog i just feel happy and calm. you are so with it! So glad Benji is better! Thank you for sharing your thoughts/inspirations/life with us! I always leave your blog feeling like I have just had a chat with a good friend. you wouldn't want to feel left out from that nasty virus, right? very sweet pictures and thoughts about your week. i love your optimism and am so happy you're all back home and healthy! oh mart. i could hardly bear the sight of tubes and tape on benji. how your heart must've broken! what a joy to have him home, happy again (although it looked like he was quite the trooper, even within the handrails of a hospital bed.) loved reading your thoughts on being the mom in the situation, and most of all, i loved the good, good news! happy homecoming, benj! ps. my little sis was hospitalized when she was 2... i remember the iv part like it was yesterday. 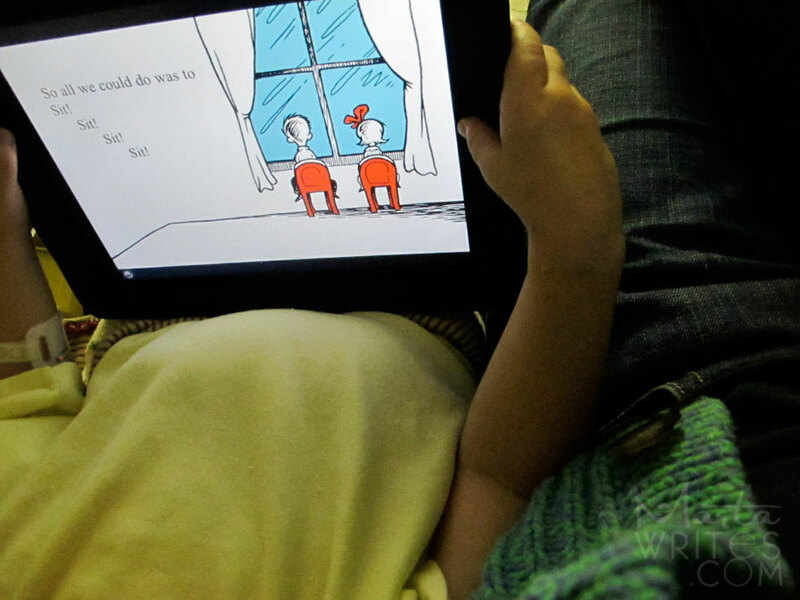 i cried and cried for her, and i wasn't even the MOM. my heart goes out to you, my friend. i know you had to be brave right along with your boy throughout all of this. way to go! now enjoy getting back to your happy routine. I am sorry to see the lovely boy at the hospital. I had my baby last month too there and it is horrible to see them sick! Missed you last week, but so glad that you're all back, safe, healthy and sound. I am so glad he is well and on the mend. Having a kiddo visit the hospital is so scary. We had to make an emergency trip there when my kiddo was four months old when he cracked his head on the driveway after I slipped on the ice. Two years later, I will never ever forget the terror of that experience and my utter thankfulness that he ended up being just fine. So glad things are slipping back to normal for you and your family. A neighbor of ours had a similar experience recently, only their sweet little boy passed very quickly, and unexpectedly. It was a shock to all who knew him. These experiences help us to appreciate all we have! Glad your little guy is doing better, hope you all get some rest this week. Marta, I am so glad Benji is back home and feeling better. Hope everything will be back to normal for you soon. oh marta! so glad you are both home and feeling better. How scary/tiring/eye-opening. In our modern life we are so very disconnected from sickness usually, the real, deep, hospital stay kind of sick. I totally relate about the, I thought we'd go home thing. Thank you, as always, for such honest telling of life. So sorry to hear about your prolonged hospital visit. Those photos of him with the tubes are bottom lip pout inducing. Happy to know he's okay and that you survived the long week. hospitals are definitely not the most fun way to spend time.... i hope your boy is feeling healthier and stronger! i really like what you said about God giving us experiences to strengthen our skills. i feel like often times my trials are to test me and help me learn new things.. but lately, i've found that the Lord has been giving me trials to strengthen skills or knowledges i may have let slide a bit. almost like a re-test! For 53 days we were one of the parents you referred to. On Christmas night 2010 we almost lost our son in the ER of the children's hospital. 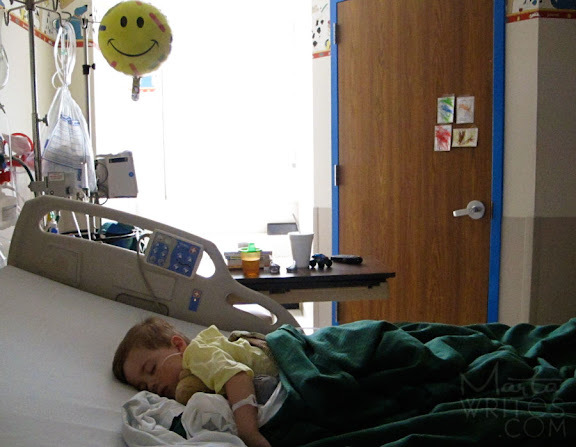 He was, by their statement, "the sickest child in the hospital" for weeks. I literally lived there, knew the nurse's names, helped with his care (I was nodding YES to a lot of your observations). In February, he came home. Tomorrow we are taking a care package to the PICU along with an update letter and some pictures. We are so, so blessed and fortunate to have not been one of the parents who leaves without their child, and our hearts ached to watch the parents who did. So happy that you were also among the Blessed. oh i'm so glad your benji is ok! i really appreciated what you wrote about suffering and trials. we are in the midst of a tough personal trial right now, so it really rang true for me. thanks for your great blogging and honesty. I am so glad to hear that sweet little Benji is on the mends and home with his family! Thank you for sharing your struggles with us. Thou it's hard to write, it helps so many others knowing that they are not the only ones in tough spots. Hold tight to the ones you love! I'm so sorry your little man (and you) have had to deal with this, but I'm glad to hear that you have felt the moments of grace that are always there when you open your heart to them. Marta- so sorry to hear about this challenging time for your family. But very glad to hear that you pulled through. You and your little one are so strong. my husband has lung issues. they are a serious, scary business. he is not good at keeping up with breathing exercises; perhaps I will have to try the chocolate milk trick.. ha. loved hearing about that, what a good way to make it fun. you are so right that these experiences are the ones that strengthen our skills and show us what we are made of. thanks for sharing your thoughts and best wishes for continued health. What a terrible scare! I'm so glad your sweet boy is alright. Thank you for your thoughts and insight on the experience, for taking time to draw meaning from it. You're a rare gem, you are. thanks for all you do. love your blog, ideas, & positivity. it means more to your readers than you probably realize. oh your sweet boy. i am so glad he is okay. those things can really rock your world. he is so sweet all wiped out on his big bed, what a brave kiddo. Phew. So glad your sweet Benji is on the mend. My Oliver has had multiple hospital visits due to weak lungs and I know how scary it is when your baby has difficulty breathing. Thank you for sharing the lessons learned during your long week. You are so wise, Marta. oh, marta! i'm so happy benji is home and safe and healthy. i can't imagine what an ordeal this was for you guys. although, wow, could that picture of him with the chocolate milk be any cuter?! I've been reading for years, but I've never commented. I'm so sorry your little Benji is sick. Little ones are strong! I hope he feels well soon. Peace to you all. Sue K.
Marta I'm so glad everything turned out alright for Benji. Spent some time in the hospital with my son a few years back and I know the unknown and watching your baby suffer is heartbreaking. Life is beautiful – made me pause and be grateful for the gifts I've been given. Such a brave little guy you have, with an even stronger mama! I was very moved by your words and photos and wish you and your boy nothing but happy, healthy days ahead!